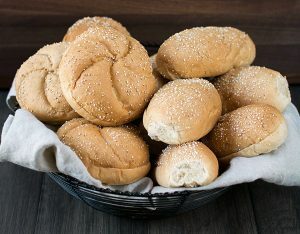 Quaker Bakery Brands, Inc. is Wisconsin’s leading manufacturer and marketer of homestyle fully-baked, frozen breads, buns, and rolls servicing leading foodservice distributors and restaurants in the Upper Midwest. The company also services major retail and c-store chains with its homestyle products as well as pizza manufacturers with par-baked crusts. We market under the Golden Home® brand to retailers, c-stores, and broadline foodservice distributors and the Quaker Bakery™ brand to commercial and non-commercial operators via our dedicated delivery routes in the Fox River Valley. A Wisconsin institution since 1937, Quaker Bakery takes pride in continuing to use the company’s original recipes. The four key ingredients in bread—flour, water, salt, and yeast—are the critical components Quaker Bakery’s masterful bakers utilize in decades-old recipes to create the handmade appearance and natural, simple taste which Quaker Bakery and Golden Home brands represent. We use special flour known to produce light and mouthwatering breads. And, we use only fresh yeast to ensure that perfect homemade appearance and texture. Don’t just take our word for high quality: our bakery is highly rated by AIB International, the nation’s premiere third party inspection company. 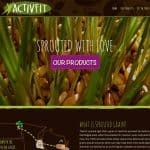 Quaker Bakery Brands, Inc. is thrilled to announce the launch of a new website for ActivFit Bakery, our brand-new product line of sprouted grain bread and buns. Our bakery products are available through foodservice distributors or directly through Quaker Bakery Brands, Inc. Contact Us for more information. Are your products available in the grocery store? Yes! Our Golden Home Bakery products and Ultra Thin Pizza Crusts are available for purchase in many grocery stores. Don’t see it in your grocery store? Contact us for more information. Have a question for Quaker Bakery?